I wanted to start up a three-parter focusing on some of the best games to introduce new folks to the European style of board gaming (also know as Euro-games, German-style gaming, etc.). This type of game functions somewhere in the space between Parcheesi and Planescape. They tend to focus less on luck and direct conflict, and more on resource management and indirect competition. 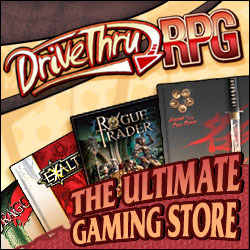 I find that they are a great way to introduce role-players to boardgaming, and a step on the way to introducing newbies to role-playing games. Up first is Carcassonne, one of three games that form a common trifecta of introductory games (along with Ticket to Ride and Settlers of Catan). 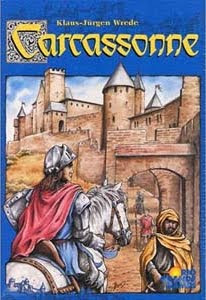 Carcassonne is based on the French city of the same name, famous for its extensive fortifications. It was designed by Klaus-Jürgen Wrede, and plays about an hour with 2-5 players. There are a three main elements that really makes a good intro game, and Carcassonne nicely embodies these. The first is simplicity. In each turn of Carcassonne you draw a random tile from a shared facedown pile and place it so it fits on the board. After you place the tile you can then put a small wooden pawn (a meeple) somewhere on the tile, which can score points. You have a limited number of markers from your pool, so there is only a certain number that can be on the board a time. A lot of euro games have multiple parts of a turn and multiple pieces, which can be a bit overwhelming, especially for a new player. The second element to an intro game that you need is a clear goal. In Carcassonne you want to have as many points as possible. You earn points by completing castles, roads, cloisters and, at the end of the game, farms. The first three are obvious, achieved through closing shapes, the last is trickier and works like a trump card at the end. The third element to an intro game is a deepening strategy. At the basic level its easy to formulate a strategy, try to earn the most points by completing things as quickly as you can. Then there are other approaches, blocking progress by making it hard for others to complete their goals, attempting to steal or share in the efforts of others, and watching the game carefully to claim the best farms. As you and those you play with learn the game better, the strategy involved becomes fun and engaging. So overall, Carcassonne achieves the three goals of an intro game admirably. It's the game I bring out when I don't want to scare people off by a trip to the gaming closet. Yes, I have a closet of games. Speaking of closets, you can also play this one with non-gaming friends, cause you really can buy it a Barnes and Noble or a Target (I've seen it both places). I heartily recommend it as a nice pre-gamenight activity, and you can see the success of Carcassonne in the plethora of expansions and electronic versions. In the next two chapters I'd like to cover two other games that have received less mainstream attention that I think make excellent introductory board games.